News from the Nevada Dept. of Conservation & Natural Resources website. 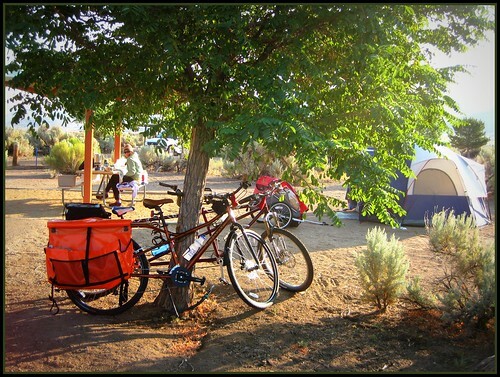 CARSON CITY, Nev. – The Nevada Division of State Parks is waiving entrance fees for bicyclists coming into any Nevada State Park the weekend of May 21 and 22, 2011, in celebration of National Bike Month. Touring cyclists may also benefit from a new State Parks policy that helps bicycle riders find camping spaces in the park, even if State Parks’ campgrounds are full. The free bike-to-State Parks weekend is being held in conjunction with Nevada Bike to Work Week, May 16 through 20 and the League of American Bicyclists’ National Bike Month. More information on bicycling opportunities in Nevada can be found at www.BicycleNevada.com or by calling 775-888-RIDE. The Nevada Division of State Parks participates in the Nevada Bicycle Advisory Board’s statewide efforts to promote and improve bicycle riding, safety, tourism, trails and events. For more information on bicycling opportunities in Nevada State Parks in northern Nevada, please contact the State Trails Coordinator, Jenny Scanland, at 775-684-2787. In southern Nevada, contact Park Supervisor Richard Keller at 702-875-4141 or visit the Nevada State Parks’ website at www.parks.nv.gov. Next Next post: West Side Cruiser Ride is ON!